Position of BB2 as on 5.30pm Saturday, (IST). 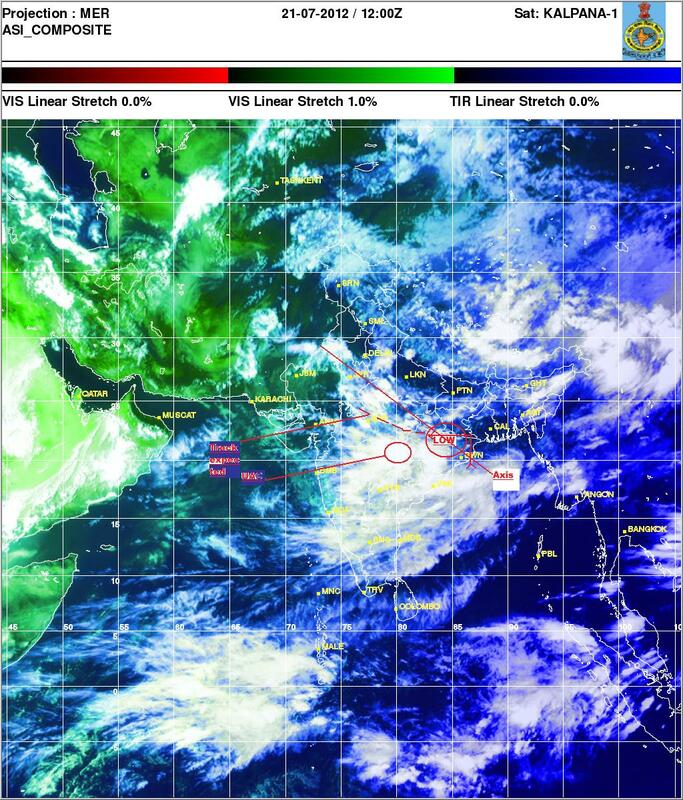 IMD satellite image superimposed with vagaries Graphics.Shown: Movement till now, Expected Track, Monsoon Axis, UAC and BB2. @ Rajesh Sir.Means there are two Low system near by near area ! One located over Chattisgarh/ Orissa border which will travel WNW direction. And second one in form of UAC over Vidarbha region ! I want know what is pressure difference between LOW & UAC ? At what mb pressure we confirm it is developed into low ! And UAC pressure slightly higher over Low ! Or what makes UAC & LOW difference from each other ! And also what is the pressure of off shore trough of west coast ! Yeah. From MJO point of view, August looks a very bleak month for rainfall. But I suppose it depends on which model you look at for the "worst" case scenario. I too is not very well verse with MJO. But can MJO alone over-ride other favourables? Can the MJO be negative and we still get rains? If so, what other conditions? It seems rather the amplitude (intensity) of MJO it is its phase that is more important. 1. During MJO Phases of 1 & 2, break monsoon type rainfall distribution was observed over India. Subsequently, as the MJO propagated eastwards, a gradual northward shift of the above normal rainfall band from south Peninsula to north India was observed. 2. During Phases 5 & 6, the above normal rainfall band was observed along monsoon trough region and active monsoon type rainfall distribution was observed. 3. During the subsequent Phases (7 & 8) a general decrease in the rainfall was observed over most parts of the country. 4. The observed intraseasonal variation in the rainfall can be explained by the changes in the convective and circulation anomalies observed in association with the formation of MJO induced positive convective anomalies over equatorial Indian Ocean during Phases 1 & 2 and its northward propagation. 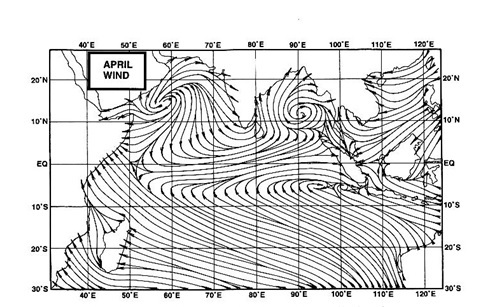 Earlier studies have also reported northward propagation of cloud bands over Indian monsoon region with MJO periodicity (Yasunari 1979, Sikka and Gadgil 1980, Gadgil et al. 2003). over monsoon trough region extended eastwards to date line indicating weaker than normal northern hemisphere ITCZ and formed dipole like pattern with convective anomalies of opposite sign along active OTCZ. 6. Around Phase 4 MJO induced OTCZ was transformed as monsoon trough over Indian monsoon region and activated western part of the ITCZ. 7. Meanwhile, the eastward propagating MJO associated convective anomaly activated eastern part of the ICTZ. During Phase 5 & 6, the activated monsoon trough moved northward to its normal position and active monsoon type convective and circulation anomaly patterns were set in. 8. During Phases 5 & 6, the dipole like pattern in the convective anomalies was reversed with negative anomalies over equatorial Indian Ocean and positive anomalies along ITCZ. Associated anomalous subsidence motion over equatorial Indian Ocean and anomalous rising motion over monsoon trough region caused stronger than normal monsoon circulation. the amplitude of the MJO plays a significant role in this association, the Phase of the MJO seems to be more deciding factor. Rajan: the IMD note is generalised..dont you think so..i mean it is a general note, a sort of an education on MJO vis-a- vis Indian Monsoon..again like i mentione on phone, it may vary from situation to situation. But a overall understanding of MJO is relevent also..Thanks. That's right Rajesh. Its general but for beginners this could be a Guide for Dummies. Correct me if I am wrong. The MJO is now between Phase 4-5. Even if its amplitude is weak, what I understand from these general principles is that the Phase could over-ride its amplitude viz we can expect good rains despite poor amplitude. Is this behind the IMD's rather bullish forecast for August? Or is this still a very simplistic or even a wrong understanding of the basic principles? I have taken till end of the month for granted - the best rains for the season so far. Trying to get understand the possible monsoon behaviour in August. Are there any good websites to understand weather terminologies? For instance difference between low,vortex,uac,mojo?? ?